What is winecrafting all about? Well, I’m tempted to answer: “farming, a bit of spoiled grape juice, a good buzz.” But, I won’t leave it at that. I use the term winecrafting vs winemaking to make a point. I don’t really “make” anything. Yeast do the making. And while many people think of wine as an art, I see it as a craft. Unlike painting, sculpture, or music, you don’t need any special gene to be successful in wine, with the possible exception that it helps to have a solid sense of smell (and taste). Instead, wine, like any craft, simply demands dedication, practice, and learning the trade from the ground up as an apprentice under a suitable mentor. There are wines out there that are merely about process and flavor, and they have their place. Just as your need for a cheap, reasonably-good-looking, functional office chair can be quickly filled by a trip to Office Depot to purchase a mass-produced piece of furniture, so too can acceptable-tasting wines be produced on a grand scale through manipulation. I sit on just such a chair in my office, and I’m not above drinking wine like that on occasion (well, on weeknights). But my kindred spirit is the true furniture-crafter, working away in his barn/workshop in the backwoods of Vermont, methodically crafting a chair. He has a rough idea of his vision as he reviews his collection of exotic woods, selecting a heart cut of maple for its durability. He inspects the grain, the size, and the knots on this board, and sets in to mill the boards accordingly. During assembly, he draws on the skills he’s learned over the years, using tools that remain irreplaceable despite thousands of years of advancement in technology. When complete, the piece is sealed with the finest stain specially chosen to emphasize the knot he has skillfully left just off center in the heart of the seat. To me, winecrafting is the same. It is about selecting the proper land and vineyards to begin with. It is about farming with rapt attention and care, yet with the flexibility to respond to Mother Nature’s mood that year. It is about hovering over the fermentations, yet interceding only when necessary. The crafting is done by hand, using traditional tools that defy modernization and mechanization. Cooperage is like a spice rack, and filtration is performed only when absolutely necessary for soundness or in the case of a wine that desperately needs polishing. In the end, if the furniture crafter and winecrafter have done their jobs well, they have both created something that is sound in its core purpose (as something to sit upon and something to drink), but something esthetically pleasing to the soul as well. Moreover, it is the uniqueness of their respective works—grain and design in the furniture, reflection of vintage in the wine—that contributes to the beauty in a way not able to be captured by mass-production. Moreoever, on a spiritual level, I believe wine, in all its chemistry and complexity, tells a story of all that has gone into its creation. The winecrafter’s job—my job—is to take all those complex individual stories of the land, the vineyard, the farmer, the vintage, the cellar, the cooper and the winecrafter himself, and select and link them to form the greater epic that becomes the bottle of wine. Finding an authentic farmer, a soulful piece of dirt, a colorful cooper, and a beautiful vineyard yields a wine—when crafted properly by the winemaker--that is equally authentic, soulful, colorful, and beautiful. Road 31 is a wine of place, craft, and story. Beautiful vineyard produce beautiful wines. This may seem merely poetic, but consider the science behind such a statement. Vineyards with rock or red soil are obviously more visually stunning than just plain brown dirt; it turns out that rocky vineyards or volcanic soils produce more complex root structures and thus much more complex wines. 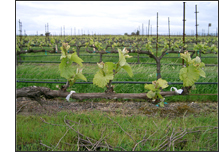 It’s nice to have a vineyard with a view; that slight elevation gives a vineyard better drainage and thus an earlier bud break and a longer, more flavorful growing season. People love to be able to see the ocean; that wind, fog, and marine influence create perfect growing conditions for Pinot Noir. Although I only craft one wine, it is a blend of three—and sometimes four—vineyards. These different sites, all within two miles of one-another, guard the southern “gateway” of Napa where the cool breeze and fog from San Francisco Bay gets channeled into the Napa Valley itself. The vineyards I pull from then have their own individuality, but they all fall within this little corner of Napa that has perfect conditions for Pinot Noir. Cab doesn’t stand a chance down here. I don’t own these vineyards—the dirt itself costs a digit or two more than I’ll probably ever be able to afford—but I have an ongoing “evergreen” contract with each. In fact, I have my own particular rows, farmed according to my instructions. I tend to the vines as often as needed, and then some. 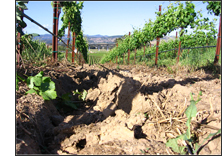 An old saying goes, “the best fertilizer for a vineyard is the winemaker’s footprints.” So true. Although, with me it is also a tire print from the truck. Located just off the water, a few dozen steps from where the Napa River spills into the San Pablo/San Francisco Bay, the Nord Vineyard is a meticulously-farmed plot that John Kongsgaard turned me onto in 2000. It is cooler than the cool, as it lies more south—and therefore more exposed to the water, wind, and fog—than it’s Carneros bretheren across the river. In fact, the vines at the far west end are incredibly stunted in their growth from the beating they take from the wind. While the overall vineyard is planted to many different selections of Pinot Noir (as well as Chardonnay and Pinot Grigio), I claim as my own approximately an acre and a half of clone 115 Pinot Noir that sits on the leeward side of those wind-whipped vines. The Nords, a multi-generation Napa grape-framing family, own and tend this inspirational piece of dirt, and you couldn’t find more honest, friendly, or experienced stewards of the land. As a low-land, slightly more vigorous site, it yields the prettier side of pinot: cherry, cola, rose, strawberry. The cool breeze allows the fruit to retain its acidity, forming a solid aromatic and acid backbone to Road 31 Pinot Noir. A half-mile northeast of Nord, but three hundred feet of elevation above on a ridge, is the magic spot known as Suscol. Phelps, Patz and Hall, Far Niente, Chalone, Mondavi, Luna…the list is long of those who compete for fruit from these volcanic, rocky soils that hang just above the fog line overlooking the entrance to the valley. 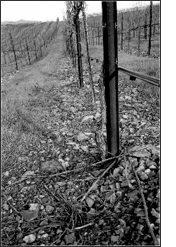 A former caved-in volcano with the rocky “soil” to match, there is very little Pinot Noir planted here, and my six rows of “667” clone span across the rolling ridge side, facing north, which helps protect the fruit from heat generated when the sun reflects back up from the rocks. The soil here is so well drained that one can stand with a hose pointed at the ground for hours and never get a puddle. Needless to say, the vines struggle on Suscol Ridge, as do the farmers. Vigor is extremely low, as are yields. I’ve worked with this fruit since 2001, and the resulting wine is dark, inky, with earthy aromas, blackberry flavors, and big tannins. A famous spot, just across the river from Suscol and Nord, this site actually lies within the Carneros boundaries. Saintsbury Winery pulls Pinot from the block to the west of me, Acacia pulls the Pinot to the south, Cakebread pulls Chardonnay the block on the North, and to the east lies the Napa River and a view of Suscol and Nord. My five rows straddle the highest point on the vineyard, not far from the lone tree that was spared during planting because a golden eagle family inhabited—and still inhabits—its upper branches. I’ve chosen vines from clone 777, which is typically more aromatic. The flavor profile of the resulting wine typically falls somewhere between Nord and Suscol, with more friendly acidity, and softer tannins. Unprotected, up on the hill, wind is a factor here, but sunshine is plentiful. The first vintage to include Stanly is the 2004, and it has elevated every aspect of Road 31 Pinot Noir. In 2003, I banded together with a number of my fellow small-label producers (most of us play on the same soccer/drinking team as well) to cooperatively share crush and cave space in a beautiful little hanging valley on the southeast corner of Stag’s Leap District in Napa. The winery/vineyard is called White Rock, and it is a spiritual place: it was the site of some of the original plantings of grapes in the Napa Valley back in 1870. As their caves have always held more than their low yields produce, they’ve always had a client who rented the back of their cave space. Christopher, the son of the White Rock family and center fullback on the team, showed up at practice one day with a proposal: he had 1500 cases worth of cave space available to rent, as White Rock’s former tenant, Jade Mountain Vineyards, had gone off and built a winery for itself. My initial thought was, “I wish, but I only make 200 cases.” But there were my other friends, each with their own 200 or 300 cases of their own. Now there are seven of us: vineyard managers, wine sales reps, architects, as well as other winemakers. We share equipment, cave space, and knowledge. These are all top-notch wines; I do believe I am the least expensive offering in the bunch. We refer to ourselves as “the College,” and the camaraderie and discussion is lively. It is a special situation. The caves themselves are not open to the public. But, if you ever want a tour, simply write or call me. If I am in town, I’ll happily show you around.